In the late-seventeenth century, Quakers originated a unique strain of constitutionalism, based on their theology and ecclesiology, which emphasized constitutional perpetuity and radical change through popular peaceful protest. While Whigs could imagine no other means of drastic constitutional reform except revolution, Quakers denied this as a legitimate option to governmental abuse of authority a… nd advocated instead civil disobedience. This theory of a perpetual yet amendable constitution and its concomitant idea of popular sovereignty are things that most scholars believe did not exist until the American Founding. 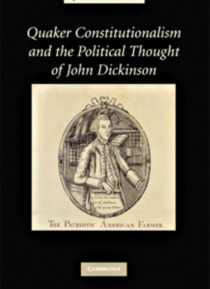 The most notable advocate of this theory was Founding Father John Dickinson, champion of American rights, but not revolution. His thought and action have been misunderstood until now, when they are placed within the Quaker tradition. This theory of Quaker constitutionalism can be traced in a clear and direct line from early Quakers through Dickinson to Martin Luther King, Jr.